Fans of all types pf music can definitely associate in one way or another, with the amazing Neil Diamond. To date, Neil Diamond has been releasing great music and songs for 50 years straight, and he’s still going strong. A mega-superstar in the music world, Neil Diamond is known for such hits as Love On The Rocks, Sweet Caroline, Song Sung Blue, You Don’t Bring Me Flowers, Cherry Cherry, Forever In Blues Jeans, America, Shilo, Girl You’ll Be A Woman Soon, Cracklin’ Rose and so many more. Scroll down to check out some of the music videos we found of Neil Diamond songs. This 2017 Neil Diamond World Tour is set to hit up North America in early April, and zig-zag across the country all the way through mid August. This includes a few stops in Canada too. You’ll be able to see Neil Diamond live at a venue near you in such states as California, Arizona, Oregeon, Texas, Colorado, Washington, New York, Pennsylvania, Michigan, Minneapolis, Indiana, North Carolina, Georgia, Louisiana, Kentucky, Tennessee, Nebraska, Oklahoma … about 40+ stops in all! (so far, hopefully more dates will be added). 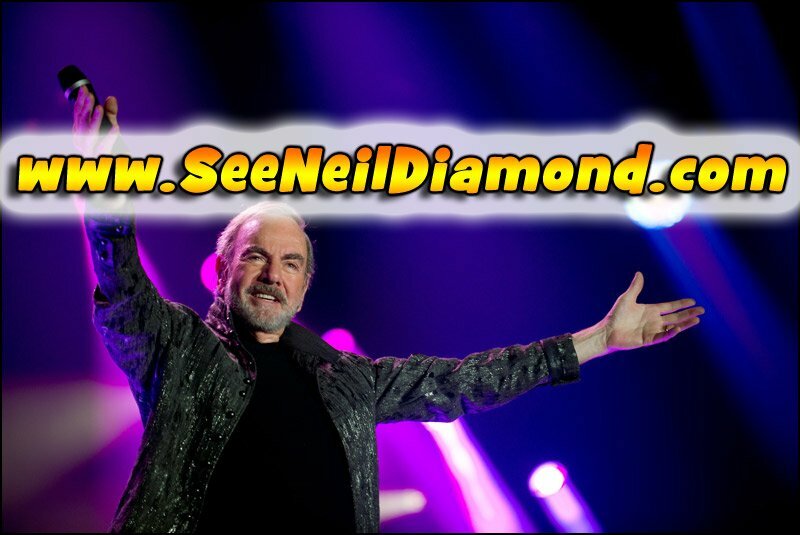 Look below for the latest list of NEIL DIAMOND Tour Dates, to look for tickets, and to check out some cool music videos. Don’t miss your chance to see Neil Diamond live in concert in 2017!! Check this often as we will add to it if and when more dates are released. Neil Diamond – All Time Greatest Hits Playlist – Over 40 Songs!